HydraFacial MD® - Why Should You Get One? Summer is here! Well, sort of! It’s the time of year when we holiday and hope that our skin can handle the summer “sun” and then, if we’re lucky, retain any summer glow we might get! Using the right products for your skin is key to keeping it healthy but on top of that it can be good to treat your skin with something extra every few months to keep it in tip top condition! And that’s where the HydraFacial MD comes in! Read on to find out more about HydraFacials and why you should get one for your skin! What Is The HydraFacialMD Treatment? Contrary to its name it’s not a facial at all! The HydraFacial machine is a actually a skin resurfacing treatment similar to microdermabrasion and is a treatment that is fully customisable to you and your skin needs. One of the things that makes HydraFacials so great is using the vortex fusion – a vacuum based exfoliation tip that goes over your skin to extract impurities, exfoliate as well as adding peptides and serums. 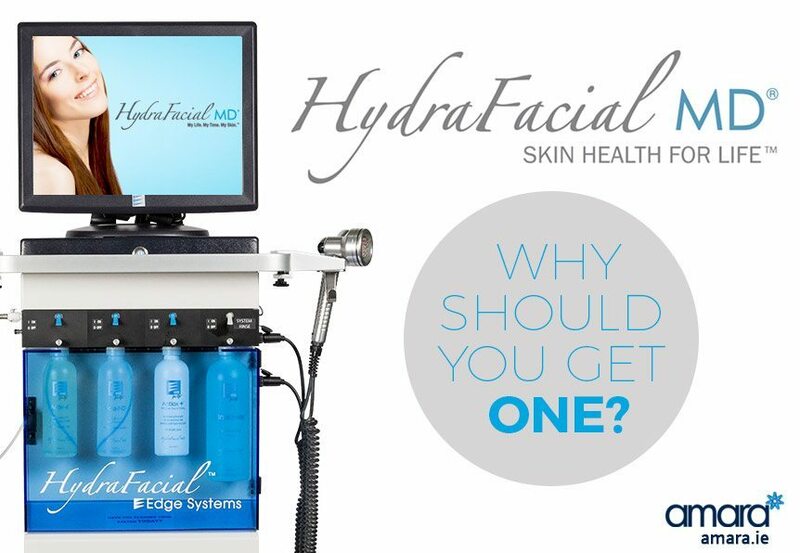 6 reasons to get the HydraFacial MD®! The HydraFacial really is a revolutionary new treatment and here are 6 compelling reasons why you should consider trying it. Unlike dry microdermabrasion which leaves your skin red, dry and tender, the HydraFacial has no down time! Depending on the strength of the peel some people may be slightly rosy straight after treatment but this will come down quite quickly. Can Be Done In Just 30 Minutes! Depending on your skin needs the treatment is fully customisable. A Mini version is also available that does not include all of the steps and is perfect for an express refresh! Unlike other Skin treatments you can see an instant result with the HydraFacialMD. Straight after your first treatment you can clearly see a glow and fresh look to your skin. The next day is even better! Even the most sensitive skin (think rosacea) is suitable for the HydraFacial. The steps and strength of the peels are completely customisable to whatever your skin needs. Red or blue light therapy can also used. Unlike standard facials the HydraFacial MD is a treatment guaranteed to help rebuild your skin health as well as address any skin concerns you have. Though results are seen from just one treatment, multiple sessions are recommended for maintaining health or addressing concerns such as Acne. Get Your HydraFacial Treatment Now! What are you waiting for? If you’d like to get your skin ready for summer and want to see how a HydraFacial can improve your skin then book yours now! Spaces are filling up quick so give us a call now on +353 1 676 1074 or contact us online to book in now and sort out your summer skin!